Farmer Foodshare reshapes the disconnected food system by removing barriers to growing and accessing local food. Their vision is a healthier world in which all people have access to nutritious food. 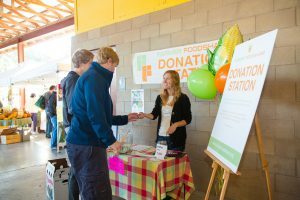 Their strategy is a simple farmers market-based approach through which volunteers collect food and monetary donations from market shoppers, buy from the farmers at market, and donate the resulting food to a local hunger relief agency.